Tiny bathrooms seem to have become the norm in contemporary urban interior design. The problem is that there are simply too many things that need to be stored and too little space to store them in. So what can you do to combine beauty & functionality in a tiny bathroom that barely manages to fit the sink, tub, and toilet? Of course, you could fill it with traditional storage cabinets which will literally make you feel claustrophobic, or you can take a look at our ingenious cabinets for small bathroom ideas. Have you ever considered adding storage space under the sink or the bathtub? This is where we talk about small bathroom ideas with tub. When it comes to bathroom design, anything works, especially budget-friendly solutions, such as DIY shelves, jars, small stands, baskets or rough wood cabinets. 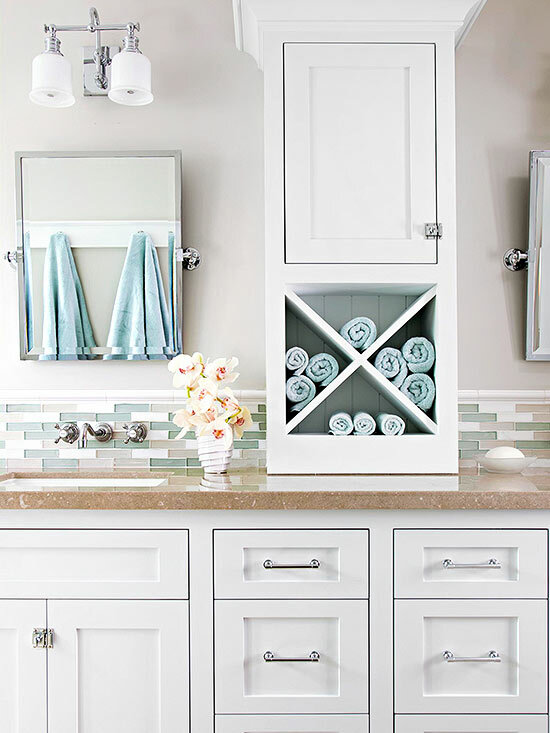 If you want a happy bathroom that combines design and functionality you can also apply some simple tricks that make a room feel larger (example: white paint or large mirrors), or employ clever ideas to maximize storage space. When you have a very small bathroom, every square centimeter counts, regardless of the fact that it is horizontal or vertical. Many homeowners make the mistake of not using space on their walls, but you know better. Just take a look at this elegant wall cabinet inspired from Miss Mustard Seed. It is flat, so it won’t take up much space, and it is ideal for holding towels, toilet paper rolls, and other products. 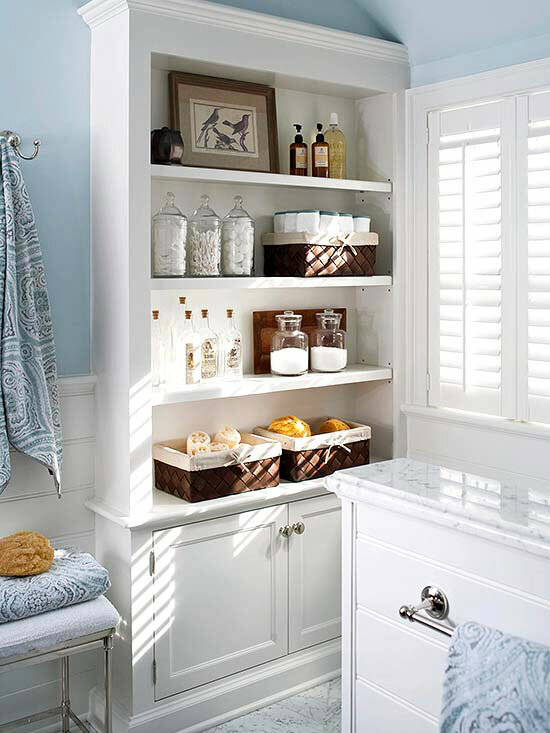 Cabinets for small bathrooms can be easily re-purposed, and better organized with the help of some stylish baskets. Head over to your flea market, purchase some simple, square baskets, repaint them for an antique look if you will, and add similar objects in them. This way you will be able to organize stuff and maintain a cohesive look. Having many cabinets doesn’t necessarily mean that you have a place for everything. Cabinet drawers are usually 24-30 cm tall, and this means that you might be wasting good space with smaller objects. 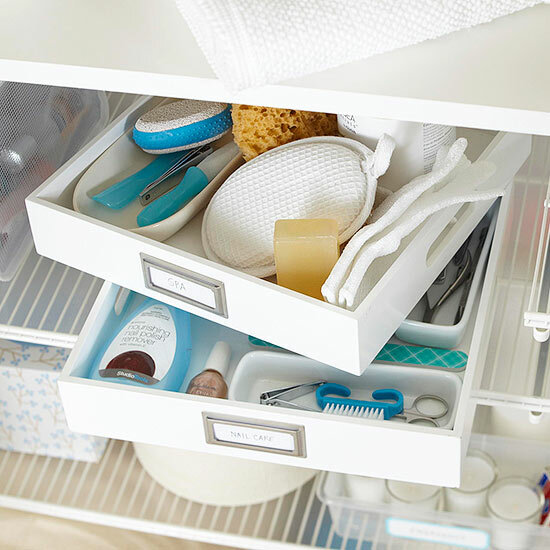 You can use trays and dividers within a drawer to organize your nail, spa, and cosmetic supplies. This will avoid the clutter, and help you label your belongings accordingly. Are you low on storage space? 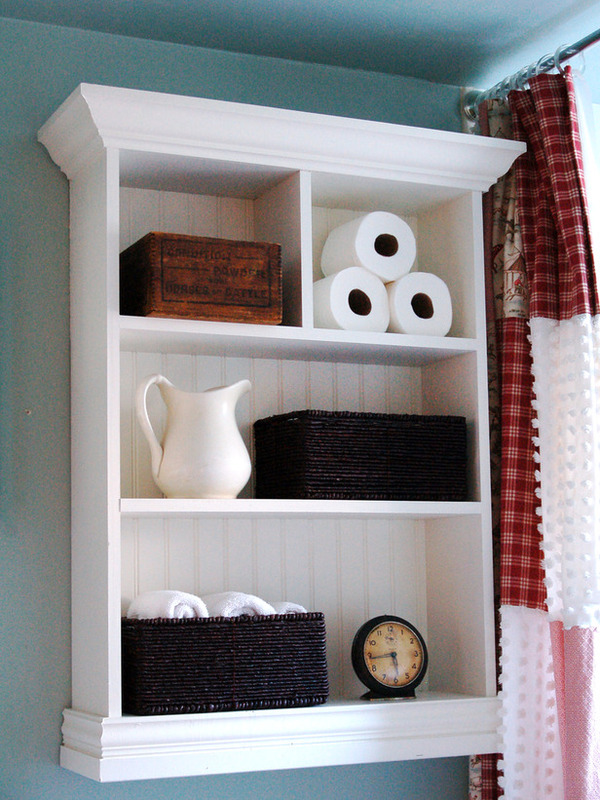 Here are our small bathroom storage ideas. Cabinets for small bathrooms can also be placed under the sink (most people don’t even consider this possibility). This is the perfect place for storing cleaning products, or daily-use objects such as brushes, cosmetics, curling irons etc. You can even use some pull-out drawers, nooks or battery-operated stick-on lights for style. As we already mentioned, bathrooms might lack in square meters, but they make up for it in height. 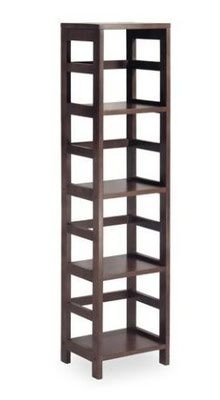 One of the easiest, cheapest and most effective small bathroom ideas or storage solutions is a tall, open shelf unit. It can fit perfectly between a toilet and a vanity and can store many essentials such as toilet paper, towels, and cosmetics. Kitchens benefit from a plethora of storage solutions. The same cannot be said for bathrooms. Still, you can draw inspiration from your kitchen, and use some pull-out drawers in your cabinets for small bathrooms. It’s exactly the same concept as the lazy susan because it enables you to quickly access the depths of your cabinet without having to dig through other stuff. Do you want to maximize the space in your bathroom? Here’s an excellent idea. You can hang a magnetic board for organizing make-up, in a residual space such as the back of your door, or the inside of your cabinets. Any bit of blank wall that isn’t serving a purpose could hold it. Learn how to do it here. A double vanity can receive more storage space with the help of a countertop cabinet. Once again, you can keep the clutter at bay by organizing styling products, towels, and brushes in the same place. 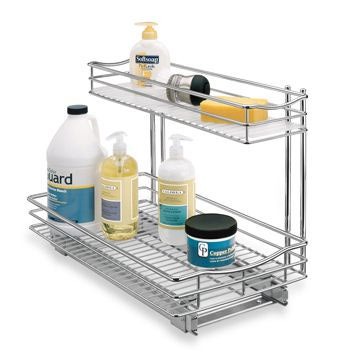 You could also use a divider on the lower shelves, and roll up your towels for extra space. How’s that for small bathroom ideas? Most cabinets for small bathrooms and kitchens are set 6-10 centimeters above the ground. You can make every centimeter count in your bathroom, by adding narrow shelves under the vanity, for washcloths and bath towels. You have no idea how much good an extra 20cm could do in a small bathroom. It could mean the difference between having inbuilt storage, and not having it. Take a look at the following example, and tell us how useful it seems to you. It is the perfect storage solution for cotton swabs, cosmetics, spa bottles, towels etc. You can even stash the cleaning supplies in the lower cabinets and add baskets for small stuff like nail clippers or polish. Martha Stewart always comes up with the best interior decoration, small bathroom ideas, and organization ideas. She says that you can make space for supplies over the bathroom door so that they can be used and replenished. All you need is some wood screws and wooden shelf brackets to screw your shelf in. 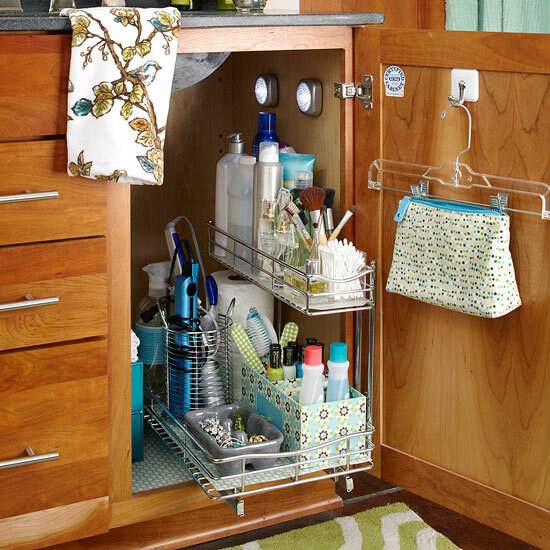 On it you can store bar soaps, cleaning supplies, and other things that you don’t use very often. Everybody knows that storage space provided by bath tubs and showers are too slippery and annoying to hold anything. 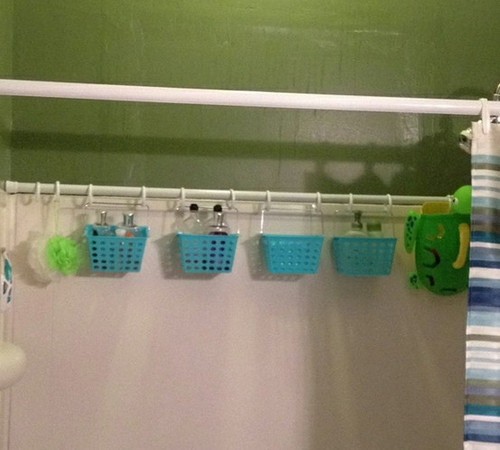 Reddit is brilliant when it comes to life-hacks as well as small bathroom ideas We found that you can use two shower rods with secure baskets to hold shampoo, creams, and shower gel. This way water will easily drain out, and you will never have to worry about dropping the soap. As far as small bathroom ideas with shower are concerned, we’re loving this one! Do you have a closet nearby? Then you needn’t worry about cabinets for small bathrooms because you can place the essentials in it. 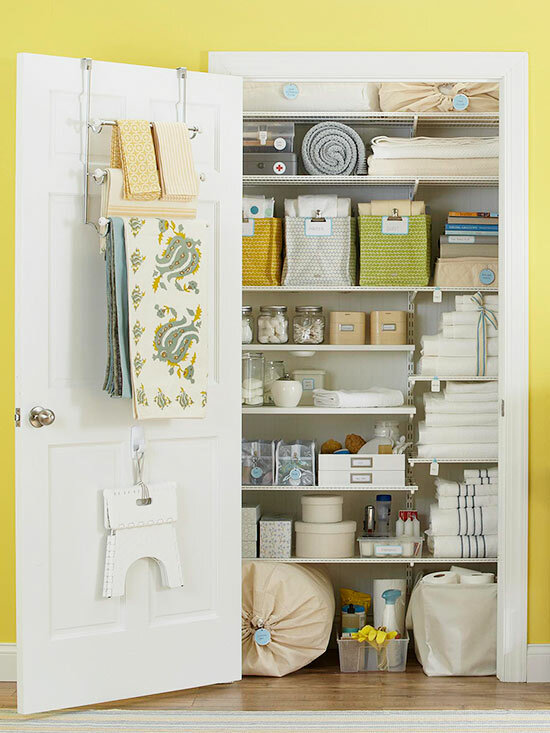 Put every inch of a linen closet to work, by adding extra towels, toilet rolls, cleaning supplies, sheets, and stuff you don’t use all the time. Label every container so that you know where they belong, and make them go all the way to the ceiling. 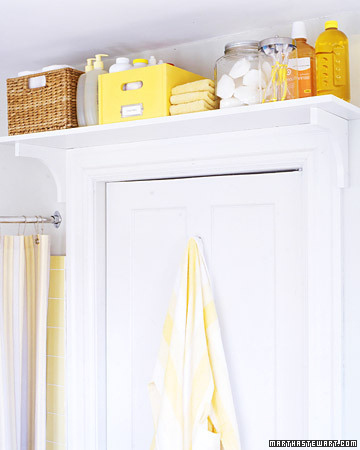 Add some hooks on the door, and hang additional towels and supplies. For average or large sized bathrooms medicine cabinets are a nice idea, but in smaller ones they are essential. The biggest advantage to them is that you can easily tuck away toiletries, and cosmetics to free up counter and cabinet space. Not to mention that this storage solution will make your bathroom look modern and chic. All you need is a box made of wood, with a few shelves. You could also use mirrors on the doors, to make the bathroom look larger, which is great when it comes to small bathroom ideas. If you don’t have many cabinets for small bathrooms, every inch counts. 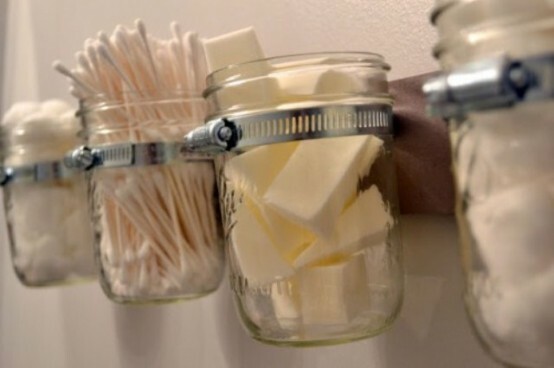 The best way to maximize storage space within your cabinets is by applying small StickOnPods. You will never lose your eyeliner or nail polish again. Not everyone has the privilege of owning his own bathroom, and this means that multiple towels will be used. Even within a family, everyone has his own towel, so it would be nice to organize towels accordingly. This ingenious small bathroom idea for using coat hooks as towel rods will help you save up on space. Instead of staring at a wet, sopping mess every time you look under the kitchen cabinet, why not carve out a creative storage space? The idea is very simple: you can re-purpose kitchen and under-cabinet storage or simply use generic wire storage racks. They don’t get wet, and they are one of the most effective, inexpensive solutions for under-sink units. Need more cabinets for small baths? Here is a simple, yet very effective cube storage unit for a small bathroom layout which is commonly used in offices, but can become an inexpensive way of adding extra storage to the bathroom. All you need is a standard piece that looks bathroom friendly (you can paint it in white). 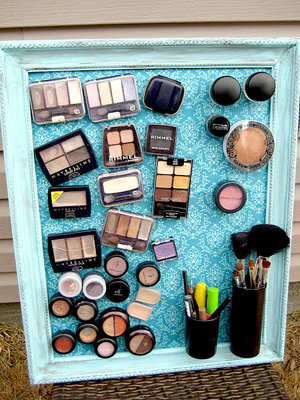 Add hooks on the sides, for towels, and baskets for organizing cosmetics. You can also store stuff on top of the storage cubes. Re-purposing jars has never been more fun. 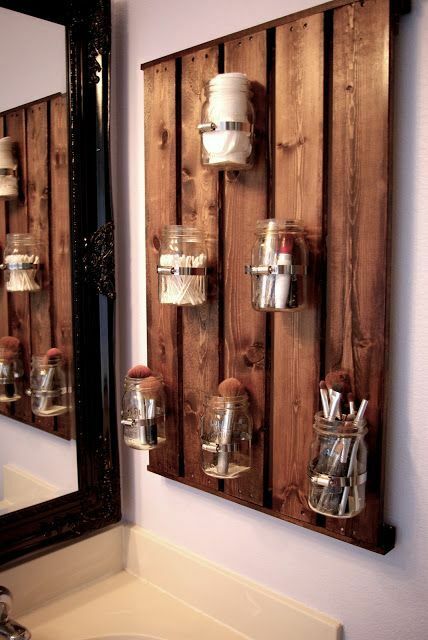 All you need to do is hang them on a piece of faux-wood, or directly on the wall. Store your bar soaps, Q-tips, or make-up products in them. 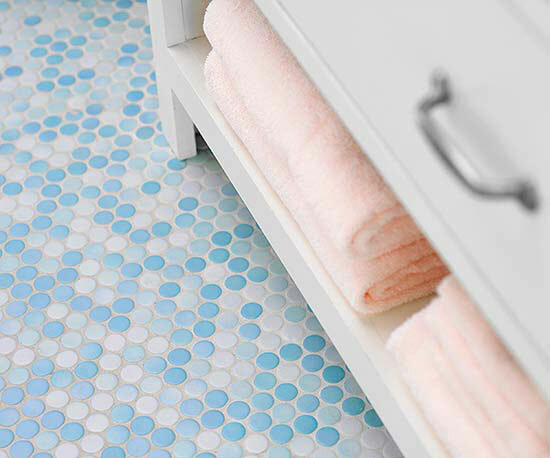 You will not only be saving up room but also making your bathroom look better. Freestanding storage is always a good idea, especially if you are planning on redecorating and changing the order in your room. Ana-White came up with an excellent storage ladder on which you can place different things such as towels, toilet papers, wicker baskets, cosmetics etc. You could also paint the ladder to add more personality to it. As far as a small bathroom idea goes, this one takes the cake! For even more ideas, please check out our piece on Interior Design Ideas for Small Bathrooms.